You are here: Home 2016 November What is Audio Video Bridging? 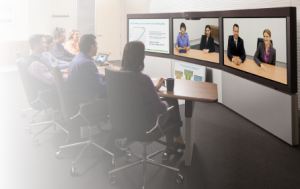 Do you notice that there is a new feature in Cisco 3850 and Cisco 3650? The new feature is that the IEEE802.1 Audio Video Bridging standard is supported on select Catalyst 3850 & 3650 platforms. What is the IEEE802.1 Audio Video Bridging? What are the benefits of Audio Video Bridging? Why Audio Video Bridging? Audio and video equipment deployments have traditionally been analog single-purpose point-to-point one-way links. This dedicated connection model resulted in a mass of cabling in professional and consumer applications that was hard to manage and operate. With the AVB standard, the audio video streams are transmitted across Ethernet infrastructure to anywhere over a long distance. Instead of one-to-one streams, the network transport enables many-to-many transparent plugand-play connections for multiple audio and video endpoints, including talkers and listeners. This helps corporations lower total cost of ownership (TCO) through reduced CapEx (less cables) and reduced OpEx (no license fees for any proprietary technologies). It also provides higher quality, time-synchronized audio and video with more scalability, including more efficient deployment, installation, and management, to enable new capabilities. Now the Audio Video Bridging is only supported on select Cisco Catalyst 3850 and Cisco Catalyst 3650 Series Mini switches. And the first software code version on a Cisco Catalyst 3850 is Cisco IOS XE Software 16.3.1. Note that on the WS-C3850- 12x48U, Audio Video Bridging is supported only on the 1G port for Cisco IOS XE Software 16.3.1. Audio Video Bridging support for MGIG ports is coming in Cisco IOS XE Software 16.3.2. Also, Audio Video Bridging support on the Cisco Catalyst 3650 Series Mini Switch is coming in Cisco IOS XE Software 16.3.2. In the following part there are some quick questions to help you know more about the AVB. Q: Have Cisco Catalyst Audio Video Bridging switches passed AVnu certifications? A: The AVnu certification tests with Cisco Catalyst Audio Video Bridging switches are being planned. Q: What are the license requirements for Audio Video Bridging? A: Audio Video Bridging requires IP Base or IP service license software. Q: Is Audio Video Bridging supported on switch stacking? A: No. Audio Video Bridging is supported on standalone switches. The feature is not available on stacking switches. Q: Is Audio Video Bridging supported on switch uplink ports? Q: Is Audio Video Bridging supported on Etherchannel ports? Q: Does Audio Video Bridging support traffic routing between Audio Video Bridging endpoints in different VLANs? A: No. Audio Video Bridging is a Layer 2 technology. AVB traffic cannot be routed across different VLANs. Q: Do I have to enable Multiple VLAN Registration Protocol (MVRP) on the switch in order to run the Audio Video Bridging feature? A: No. MVRP is not a mandatory requirement on the switch in order to run the Audio Video Bridging feature. Without MVRP, you can enable VLANs to run AVB. Q: Does Audio Video Bridging support IEEE1588v2 PTP? A: No. The timing profile supported by Audio Video Bridging is IEEE802.1AS Generalized Precision Time Protocol (gPTP). gPTP is an IEEE standard defined based on IEEE1588v2 PTP. Q: Does gPTP use a boundary clock or a transparent clock? A: IEEE802.1AS gPTP combines a few features of boundary clocks and transparent clocks as defined in IEEE1588v2. It uses the Best Master Clock Algorithm (BMCA) of boundary clocks and the peer delay mechanism of transparent clocks. Q: Do I need to have an external GrandMaster clock in the AVB network? A: No. The BMCA will automatically select the GrandMaster clock from the AVB switches and AVB endpoints based on configurations such as PTP priority and so on. Q: What can be done if the peer delay value between the switch links is greater than the default value of 800ns and the gPTP stays down? A: Use the configurable PTP neighbor propagation delay threshold command to change the threshold value to greater than 800ns. Q: Can I have a converged network that passes audio, video, control, and regular data traffic? A: Yes. But keep in mind that the Audio Video Bridging standard is designed to give higher priority to the audio/video traffic. Audio/ video traffic may use up to 75 percent of the port bandwidth, hence causing data traffic to be dropped. Q: Does AVB only work on 1G Ethernet ports? A: No. AVB is supported and tested on other types of port speed (100Mbps, 1G, 10G, 40G) for the AVB Cisco Catalyst switches. Note that AVB support for MGIG ports on the WS-C3850- 12x48U is coming in Cisco IOS XE Software 16.3.2. Q: What kind of connectors and cabling do Cisco Catalyst AVB switches use? A: AVB doesn’t have specific requirement on types of connectors and cabling. For supported connectors and cabling, refer to the Cisco Catalyst 3850 Series data sheet. Q: If I have a Cisco Catalyst WS-C3850-12XS 10G fiber switch, can I use an SFP-GE-T/GLCGE-T transceiver to connect to a copper port AVB endpoint? Q: Is AVB traffic multicast traffic? A: Yes. There can be one talker and multiple listeners. The AVB traffic is replicated by the network with multicast manner. After the AVB feature is enabled, the MSRP feature is automatically run, and the AVB talker and listeners exchange MSRP declaration messages, reserve bandwidth, and program the corresponding QoS policy and Layer 2 mroute on all the switches along the path.